The perfect balance between flexibility and hardness - excellent for wet or dry sanding! 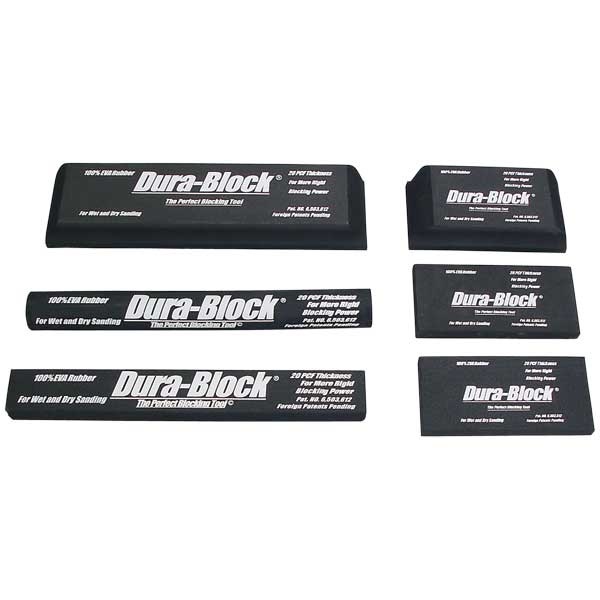 Dura-Blocks® give you the perfect balance between flexibility and hardness when sanding slightly curved areas that are difficult to finish with other blocks. 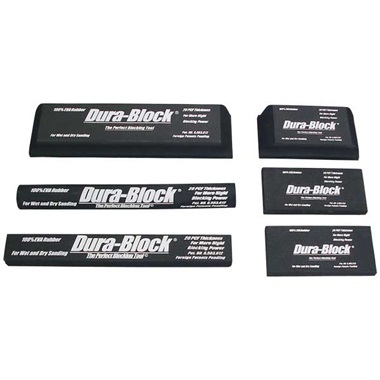 The medium and long blocks are great for block-sanding large areas like hoods, roofs, deck lids, doors and fenders. Made of 100% EVA rubber. Accepts 2-3/4" wide adhesive-back sandpaper. Sure to become your favorite sanding blocks! Set includes: 11" long x 1-1/4" wide block, 1-1/4" diameter x 11" long block, 2-5/8" wide x 5-1/2" long block, 2-5/8" wide x 11" long block, and two 2-1/2" wide x 5-3/8" long super flexible blocks. I use them everyday restoring military vehicles, paint and body work.